HTMtied Save your Internet bookmarks as tiny portable HTML link files, and use them anywhere. Free as in liberated: save your Internet bookmarks as tiny files, that you can use anywhere, outside your browser. Use your Internet bookmarks on any PC, tablet, smartphone, or in the cloud. On Windows, Mac, Android, iOS, or Linux. The bookmark files are actually tiny HTML files, that load the original Internet address, when opened in any browser. Copy any Internet address to the Clipboard, run HTMtied, and paste the magically created portable bookmark file. Copy multiple addresses on separate lines to the Clipboard, or drag and drop any number of URL files over HTMtied. No more manual pasting: click the HTMtied Direct shortcut to convert and paste all bookmarks to a preferred location. The portable bookmark files can easily be uploaded or synchronized in the cloud, with online storage services. 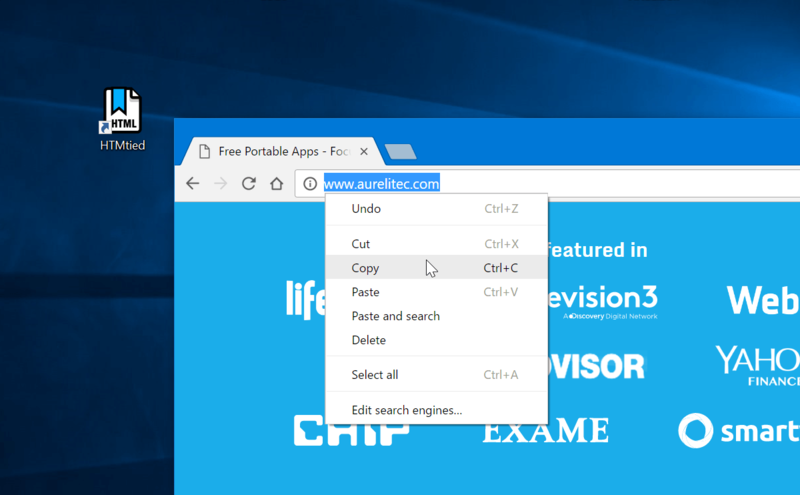 Liberate your Internet Explorer Favorites: copy the URL files to the Clipboard, or drag and drop them on the HTMtied icon. HTMtied is so easy to use that it doesn't even need a user interface. On success you'll hear the famous Tada sound. HTMtied is a very useful and yet simple tool to create an HTML file for any website links or URLs in an easy way. Create website shortcuts for opening them in the default browsers of numerous OS platforms and portable devices. If you're looking for a quick way to add website shortcuts to the Windows desktop, give HTMtied a try. For shortcuts to links HTMtied is second to none. It's tiny, portable & simple! Simply copy the URL, activate HTMtied [DA DA], then paste to desktop or any folder. The shortcut will always open your default browser.